2015 was an excellent growing season in the Finger Lakes. Moderate fruit set resulting in smaller than average crop. Warm and sunny conditions allowing for excellent ripening conditions and minimal disease pressure without drought issues. The grapes from three different vineyard sites on Seneca Lake were hand harvested mid to late October under optimal conditions. The grapes were destemmed into open top fermenters for almost 4 weeks of skin contact with gradually decreasing daily punch-downs and pump-overs. The skins were hand bucketed into the press leaving behind most of the seeds and sediment. After a few days of settling in a stainless steel tank, the Cabernet Franc components were transferred to barrels for malolactic fermentation and further aging. Roughly 3/4 French oak and 1/4 American oak barrels with an overall rotation of 5 years. The following August the components were racked out of barrels and blended prior to bottling. The wine was released at the beginning of 2017. Bright ruby color, with aromatics dominated by plum and red berries with accompanying spicy, earthy and mineral components. Moderate alcohol, lively acidity and overall balance provides harmony lending the wine to extended aging. 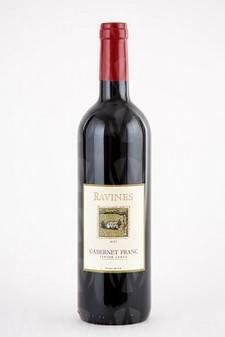 A polished style with ripe red and black fruits, sultry spices, earthy aromas and a peppery finish.